The South American U20s will be this month. It starts next weekend. 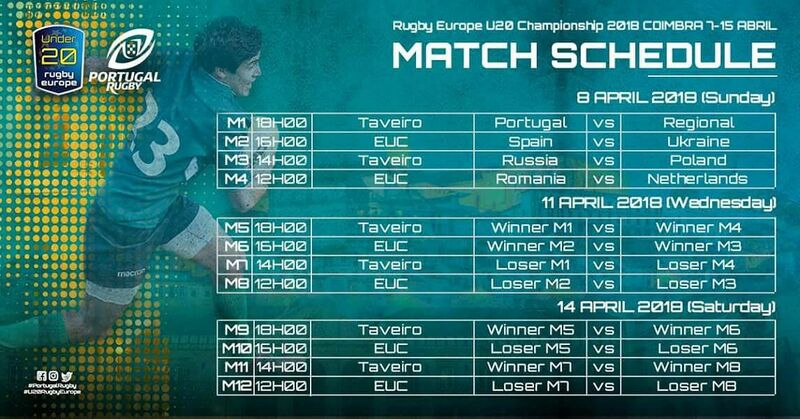 We have not a big estimation about Rugby Europe but we should admit that their website is the most useful between those of the six continental confederations. Or at least so it seems to me. They show live every game under their organization (included U20, U18, 7s, beach), they offer the recorded video of every match after its end and they usually provide also the game sheet. It's simple but it's the base for the fans' fruition. I think no one of the other confederations does the same. BigG wrote: When will be decided the World U20 Trophy host? So far we know only three participants: Samoa, Fiji and Honk Kong. It is interesting whether European teams are able to compete with Oceania or not. What about America? Do they have good teams? USA U20 team's strength is always so up in the air and depends on how much, or little, USA Rugby decides to dedicate in resources in a given year. And because of that and some other factors, some of the best American U20 players decline to play for the U20s. Not sure about Canadian strength this year. Wow Dutch are getting serious about rugby. I knew they had a lot of kids playing the game but not in such a good company. Good on them! Did I get kickoff time wrong or the streaming doesn't work? On the US side I have a couple of tid-bits. Two Tigers academy players from the recent national championship side are US-eligible. Andre Dunn is a centre and eligible through his mother, Zack Godfrey is a winger and was born in the USA. Romania closes in 32-26, physical endurance should be on their side. Let's see. And Romanian try with one man down for the Dutch, it seems over, 32-33. New Dutch try, although after a slight knock-on I believe... It's awarded any way, 37-33. Conversion missed. 40-38, Romania missed the last conversion. thatrugbyguy wrote: Bright future for Holland. Structures are ok. When you open the link AF provided and take a look at the selection you will notice the logo's behind the player's names. The coloured tulips are a reference whether the players has come through one of the four regional academies 12 to 18 years olds can attend. These are dedicated secondary schools where, when the school program is done, the boys and girls attend a dedicated rugby program. The NTC logo denotes whether they are part of the National Training Centre in Amsterdam. These guys live and study or work in the Amsterdam area and get these high performance trainings together for three or four times a week. In the weekends they play for their clubs. Apart from this the union actively tries to maintain ties with top professional clubs abroad to get the biggest talents in their respective academies. Judging by todays result and the surge of the National Team in the worlds rankings of late these efforts have clearly paid divident. I have a feeling however (maybe I am too sceptical) that we are soon to reach our ceiling. We are now in the company of nations who have similar setups and for succes we have to rely on a good generation. Just look at the U18's who got demoted from the RE championship the other week. What I am missing is what the end goal of the union is. I guess it's getting the NT to a world cup eventually (as all unions do). To get there I miss the step between club level and the aimed level of the NT. There really should be an effort to get a (or even two) team(s), best be it regional selections, in the Continental Shield to assess the actual level of Dutch rugby and to give these promising youngsters a local pathway to toprugby. (Reinforce the cooperation with Belgium and reinstate the North Sea Cup in the EPCR weekends. Damn, the folding of the NSC some years ago was an opportunity gone waste). Spain vs. Ukraine 20th minute of the 2nd half: 62-0! Unbelievable. The winner of this championship next year goes to WC Trophy. Does it? Yes... if there is any Trophy, since the host nation hasn't been confirmed yet. Armchair Fan wrote: Yes... if there is any Trophy, since the host nation hasn't been confirmed yet. What do you mean? Could you, please explain those procedures/rules. Thanks in advance. BigG, it's April and we still don't know where U20 World Rugby Trophy is taking place. The only thing we 'know' is that Namibia Rugby Union posted on Facebook that it might take place in Romania. Champion should qualify to Trophy, but it's not encouraging at all not to have news about the tournament at this stage of the season. Armchair Fan wrote: 40-38, Romania missed the last conversion. I was about to say Portugal Centro Norte was looking for another upset until I realised Portugal is playing in white and PCN using old Portugal green shirts. There has been a good crop of youngsters coming up through the Dutch academies. Quite a number have gone abroad to develop their game and maybe see if they can make it at a professional level, and I am pleased that at least some of them are happy to represent the Netherlands. Lodi Buijs (Stamford College), Koen Bloemen and Kevin Krieger (Montpellier), Dave Koelman (Leicester), Noah de Wild (London Scottish) , Stan van der Hoven (Bay of Plenty) are all products of the Dutch youth programme. Interestingly these guys are all forwards and yet the Romanian scrum and driving maul were shoving them around all over the field. Jasey van Kampen (HAC Rugby, France) and Siem Noorman (Dendermonde, Belgium) came through the youth teams of Haagsche Rugby Club. Archie van Dijk has a Dutch grandparent. Michael Mbaud used to live in the Netherlands, but I think he moved to England quite young and learnt his rugby there. Exactly, I was worried about your forwards but your backs win it for you. Good rhythm for your team and mental also. Congrats! That one was a nail biter. Romania took the lead after a dutch player was yellow carded, I was sure the game is over... but no, they kept on playing like they were full strenghth and scored a penalty - after the try wchich saw them take back the lead - Romania answered again, but it was not enough. Let's hope the dutch kids won't get TOO good, beacause then, maybe, they won't play for the national team in the future. Sorry but Romania U20 is not the team to predict strength of Dutch. While Japan, Samoa or Fiji is the teams who are good and lets see what Dutch can do against them. No disrespect to Romania U20 but they are weak.